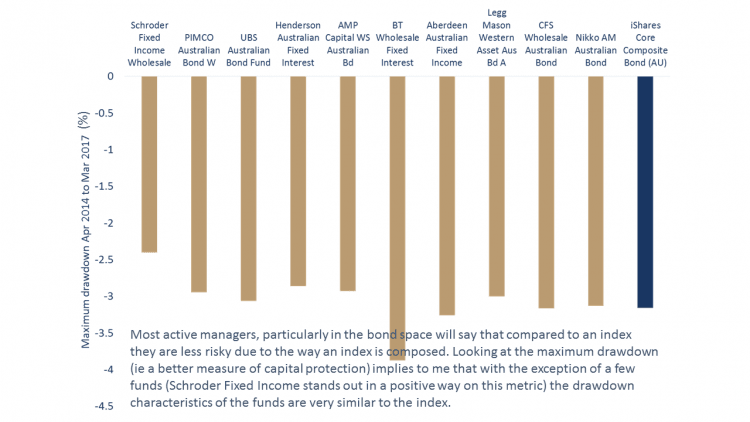 Last week we provided a quick overview of the bond funds available to Australian investors. On average, only High Yield bond funds and Cash funds appeared to be doing anything positive for investors. 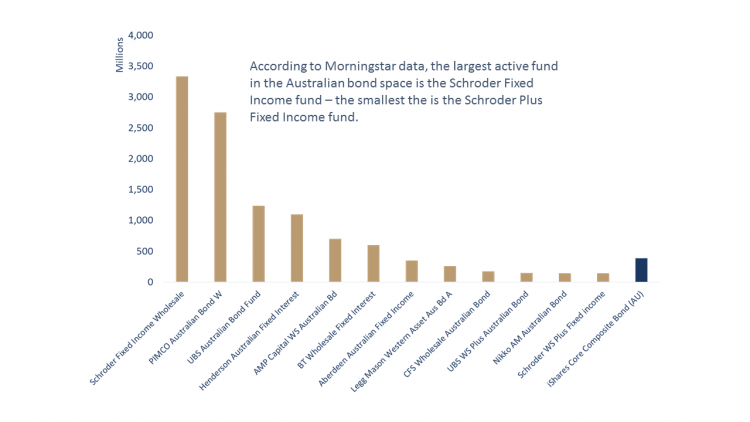 So, I decided to have a closer look at some of the biggest funds (according to data from Morningstar) to see if there were any shining lights in the active Australian bond fund space. The prospectus benchmark according to Morningstar had to be the Bloomberg Ausbond Composite 0+ Yr index. The fund had to be active. Data on returns for at least two years of total returns had to be available via Morningstar. Fees data had to be available via Morningstar. The fund size was above $100 million. This left us with 12 funds to consider. For comparison purposes, I use the iShares Core Composite Bond ETF (IAF); I find this more useful than comparing to the actual benchmark because the ETF is actually investable, has a fee, and performance includes transaction costs. 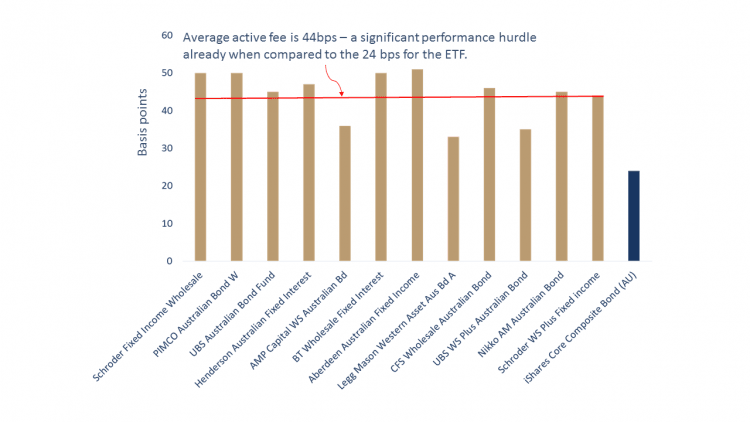 Fees for active management of wholesale bond funds range from just above 30bps per annum to around 50bps at the top end, the ETF on the other hand is 24bps. Excess returns (active funds return compared to the return on the iShares Core Composite Bond ETF) have been mixed. 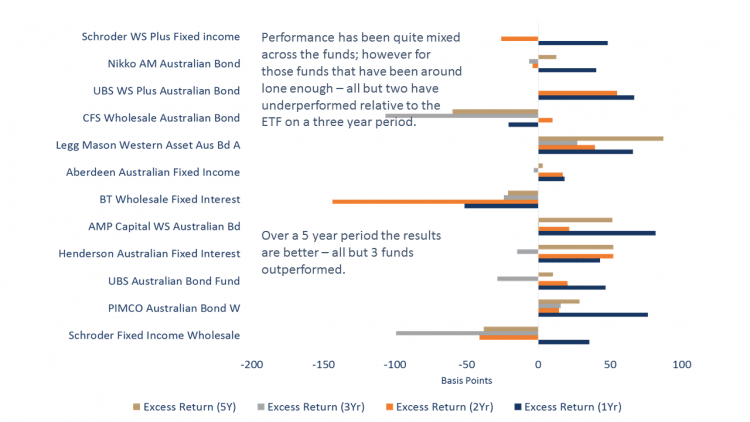 Over the three-year horizon it is only the Legg Mason Western Asset Australian Bond Fund and the Pimco Australian bond fund that have shown positive excess returns. Over five years, most of the funds outperform the ETF, the exceptions are the Schroders, BT and CFS offerings. 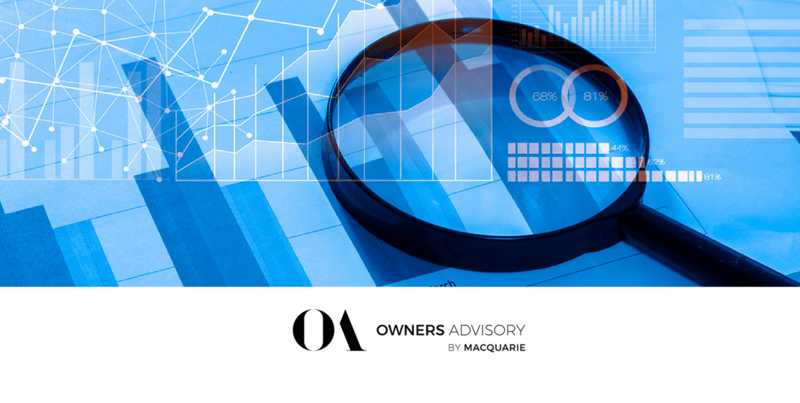 If you are considering active funds in the Australian bond space, make sure you are considering the cheapest offering available as to improve the odds that the active manager will deliver value for you. The question is whether those funds that are outperforming are outperforming by enough to justify the premium fee charged for active management. Remember that we use incremental returns to judge this. Over a three-year horizon, Legg Mason has delivered value for unitholders as has the AMP Capital Wholesale Australian Bond fund (just), however, the funds have kept the bulk of the rewards. 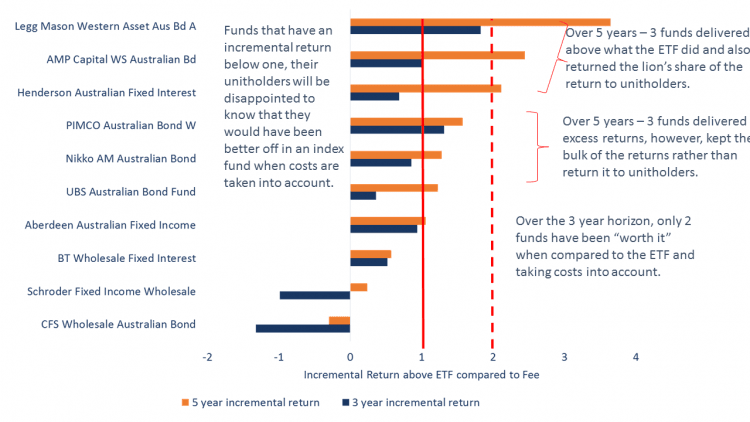 Over five years however, the picture improves somewhat with three funds delivering most of the excess return back to unitholders (Legg Mason Western Asset Australian Bond, AMP Capital Wholesale Australian Bond, Henderson Australian Fixed Interest). Of course, one of the fallbacks that active managers use to justify their fees in the face of average returns is their risk management processes. Choosing an appropriate risk metric for fixed income can be a difficult thing. Volatility, or variability of prices movements, doesn’t really capture the risk associated with fixed income. Rather I prefer to use a maximum drawdown metric justified by the fact that most investors in fixed income funds are there for capital stability. Maximum drawdown is a measure of peak (i.e. highest level) to trough (i.e. the lowest level before the fund’s returns “turned”) performance over a given time period. The metric is an indicator of downside risk and arguably more useful when capital stability is key. If using risk management to justify higher active fees is valid, one would expect that the drawdown characteristics of active funds versus a passive ETF will be meaningfully different. They are not – the only fund that can claim to be running less risk on this metric is the Schroder’s fixed income fund (if around 60bps less drawdown is significant to you). The upshot is that, at least on a historical basis, investors need to stick with their Australian bond fund manager for at least five years. Most of these funds are too expensive over a three-year horizon. It is worth noting that two of the three funds that delivered value for investors are also the cheaper funds (Legg Mason’s Australian Bond offering and AMP Capital Australian Bond offering). So if you are considering active funds in the Australian bond space, as is the case in the equity fund sector, make sure you are considering the cheapest offering available as to improve the odds that the active manager will deliver value for you.